Over-the-counter whitening strips and gels usually fall between $103 and $1004 and can take 10 to 14 days to whiten teeth.3 The bleaching agents used for these products are weaker than those used by dentists, so they require longer application times than professional whiteners to achieve similar effects. Each product will be applied differently based on the instructions included in the package. 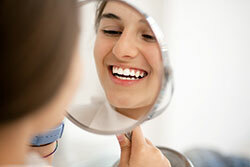 Before choosing a whitening method, consult with your dentist to determine the best option for you. Whiteners may not work on all teeth. For example, teeth with porcelain crowns and composite fillings won’t whiten along with your natural teeth, so their color may no longer match.7 Your dentist can also advise on the safety of your intended method. After or during your whitening process, you may experience a temporary increase in teeth sensitivity. Talk to your dentist if this happens to you.